After the UN Climate Conference in Marrakech, a high-level roundtable on African Least Developed Countries access to energy will be held on 6th December in Dar es Salaam, Tanzania. The United Nations Office of the High Representative for Least Developed Countries, Landlocked Developing Countries and Small Island Developing States (UN-OHRLLS) (http://UNOHRLLS.org), together with EnergyNet (www.EnergyNet.co.uk) will organize a high-level roundtable on access to energy in Africa Least Developed Countries (LDCs)* on 6th December. The discussion will be about how African countries can achieve the three universal goals on sustainable energy. Another meeting will be held from 6 to 8th December: The Africa Energy Forum: Off the Grid Summit (www.AEF-OffGrid.com). It will focus on project opportunities for mini- and off-grid technology providers working in Africa’s energy space. Among participants Ministries of energy, rural electrification agencies, philanthropic business foundations, banks, regulatory bodies, multilateral organizations and off-grid businesses . They will discuss topical issues concerning rolling-out off-grid projects across Africa, a few weeks after the UN Climate Conference in Marrakech where the LDCs Renewable Energy and Energy Efficiency Initiative was launched. What is the LDCs Renewable Energy and Energy Efficiency Initiative about? The Least Developed Countries Renewable Energy and Energy Efficiency Initiative is part of the Marrakech Global Partnership on Scale Up rapidly Clean Energy Transformation Worldwide. The Renewable Energy and Energy Efficiency Initiative (REEEI) for Sustainable Development was initially announced in Kinshasa last September where Ministers and heads of delegation from the 48 Least Developed Countries welcomed it. “The initiative will enable LDCs to leapfrog fossil fuel based energy and light up the lives of millions of energy-starved people through modern, clean and resilient energy systems, ” said in Marrakech, Tosi Mpanu-Mpanu, Chair of the Least Developed Countries Group and Head of delegation of the Democratic Republic of the Congo. This initiative aims to achieve sustainable development by linking SDGs and the implementation of the Paris Agreement on Climate Change. For Least Developed Countries UN Climate group, the Renewable Energy and Energy Efficiency Initiative will support country driven and country owned approach. It has many objectives: social, economic, poverty and development. These are to enhanced energy access. According to a concept note of the initiative, LDCs want to mobilize and build ambition and capabilities by formulating low to zero emission, resilient, development, pathways. They plan to identify and develop “the most appropriate approaches to off-grid solutions and community energy in relation to different Country contexts”. The development of Micro Small and medium sized companies and small scale agriculture and transfer of relevant technologies will be promoted to enhance access to renewable energy in these countries. Women will be actively involved in creating and participating to the accessibility of renewable energy. In Marrakech, the LDCs group launched the Global Partnership with the African Group of Negotiators and the Alliance of Small Island States ( AOSIS) and other countries and business representatives . “The Marrakech Global Partnership is a concrete outcome brightening the futures of the 1.3bn people who currently lack adequate access to energy, ” recalled Mr Mpanu Mpanu in Morocco. This global partnership involves the African Renewable Energy Initiative. The African Renewable Energy Initiative puts at the forefront the Africa’s huge renewable energy potential, according to the AFDB. “It is an African-owned and African-led effort to mobilise 300 GW of renewable energy generation capacity in Africa by 2030,” said Akinwumi Adesina, president of the African Development Bank. With the New Deal for Energy in Africa, the African Development Bank is working closely with the African Renewable Energy Initiative ( AREI) and others partners. 34 countries in LDCs are african countries. 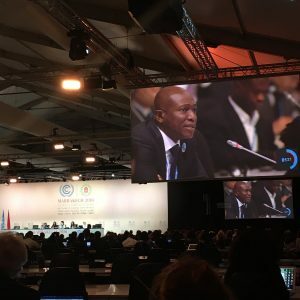 “As Africa is taking a lead through the Africa Renewable Energy Initiative, so must the rest of the world move towards low-to-zero carbon energy systems to keep warming below 1.5 degrees C, ” said Seyni Nafo, chairman of the African Group of Negotiators at the UN Climate Convention. *LDCs include 48 countries: 34 in Africa, 13 in Asia and the Pacific and 1 in Latin America.